In my progression of getting over a fear of the ocean, I decided last year that for my next challenge I wanted to literally go BIG and swim alongside the largest fish in the water, the whale shark. 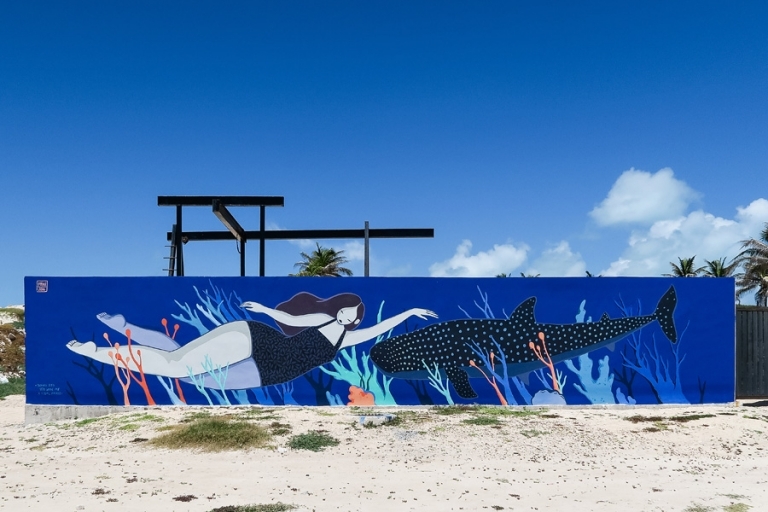 My research pointed me to a few places where one might be able to find whale sharks, including Isla Mujeres, a small island off the coast of Mexico. Only a three-hour (and direct!) flight away from Washington-Dulles and a short ferry ride from Cancun, Isla Mujeres intrigued Chris and me since we love tiny islands. Plus, neither of us had been to Mexico since we were kids, so off we went last week! 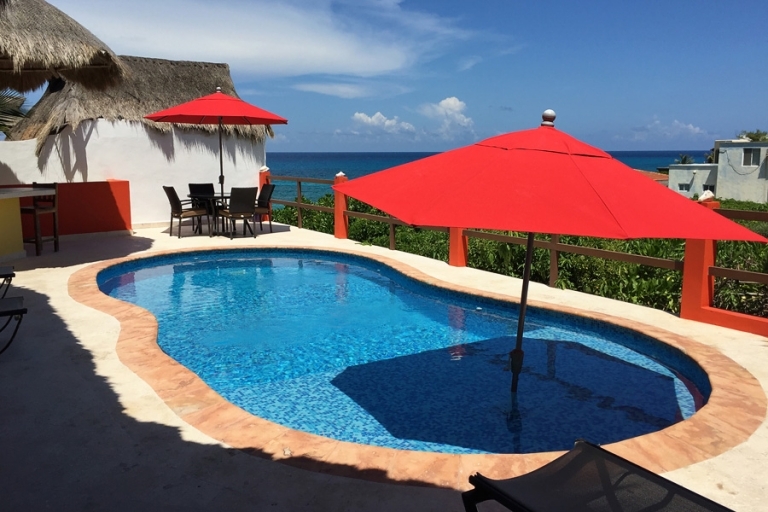 Our tradition of staying at the perfect beach villa instead of a hotel or resort continued when we discovered Casa Marchon in Punta Sur. 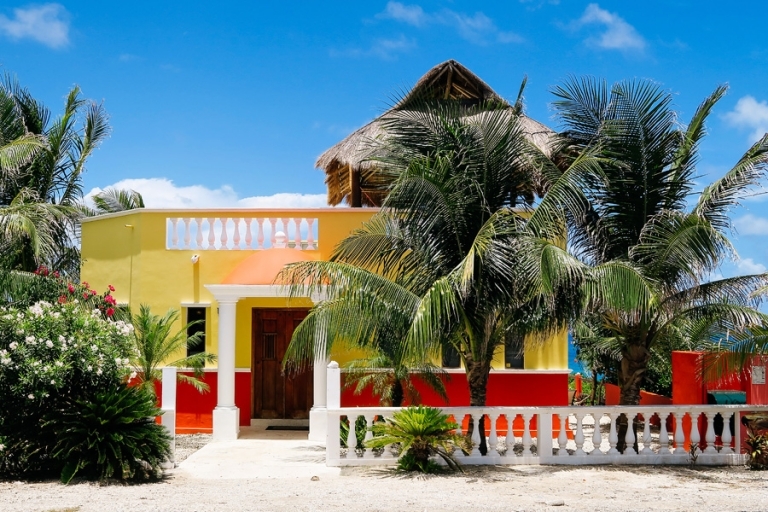 Tucked away on the quieter end of the island, but still only a few minutes away from the bustle and convenience of the main town, Casa Marchon totally suited us for a week on Isla Mujeres. We were spoiled all week by having not one but TWO pools in which to beat the heat, and giant protective umbrellas for those of us with fairer skin. When we weren’t swimming with whale sharks or exploring the island, Chris and I could be found relaxing (or goofing around) at either pool. When I planned this trip, I initially wanted to include a day trek to the mainland to visit Chichen Itza, but as we got closer to departure I hemmed and hawed about going as I watched the July forecast rise in temperatures. 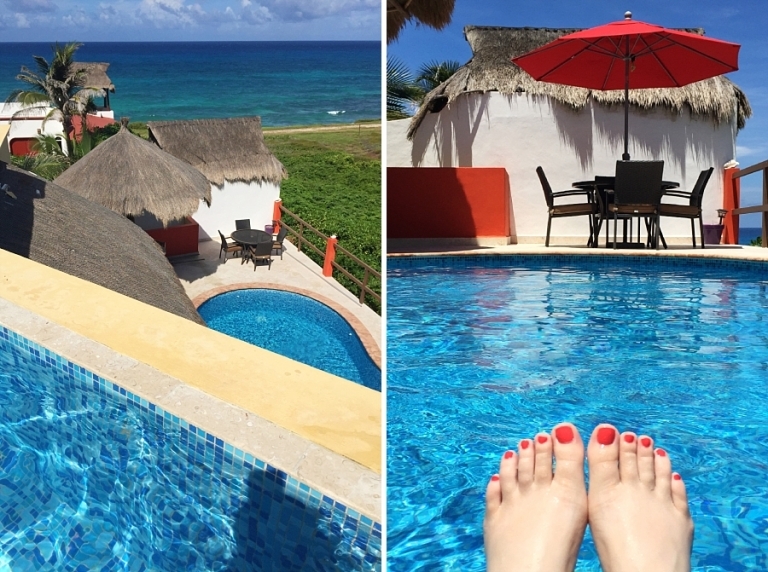 Chris and I pretty much began to melt once our plane touched down in Mexico, and we ultimately decided not to stray too far from the relief of a pool or the ocean. We’ll simply have to visit the world-wonder another time. Despite the lack of a/c, we really enjoyed our little golf cart. I brought a piece of red ribbon and tied it to our cart so we could remember which one was ours when we parked in town. I mean, I guess I could have memorized the license plate number, but…after a few margaritas, it’s just easier to spot a ribbon. Toting our snorkel gear and getting our groceries (read: cases of beer) home from the store proved to be a bit trickier on the golf cart vs. a car, but we were up for the challenge. Speaking of groceries, one of the biggest differences between Isla Mujeres and some of our other island experiences was the huge supermarket, Chedraui. I didn’t even have to pack my usual arsenal of full-size sunscreen bottles because we were able to find everything at the store! Well, everything except relish and salsa. And even better, the sunscreen didn’t cost more than it would at home. Typically Chris and I shop for food so we can eat breakfasts and lunches at “home” and then go out for dinners, but we simply couldn’t help ourselves with all of the amazing food all over the island. We loved trying the restaurants, and marveled at the amazingly inexpensive cost of food and drinks compared to other islands. And the food was so gorgeous I actually remembered to take pictures this time! I may have enough to scrape together a blog post solely on Isla Mujeres restaurants. Stay tuned. When we weren’t blissing out by the pool or eating tacos/drinking mojitos, we tried to see as much of the island as we could, from North Beach down to the Mayan ruins of Punta Sur (more on that soon). I adored the cheerful colors everywhere we looked, and managed to almost get used to the 110-degree heat index by the end of the week. Coming up next: we head out to sea in search of whale sharks! Susan - Hi Dee! 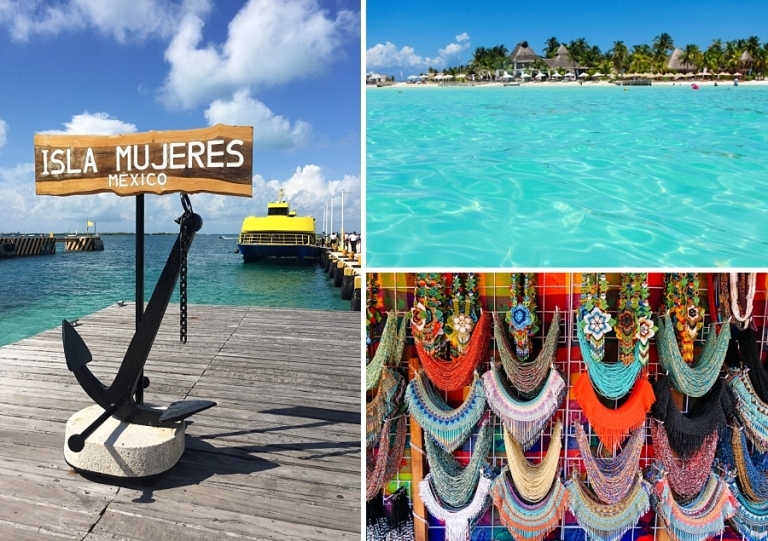 You’re going to LOVE Isla Mujeres! The MapChick maps definitely help, and I just pressed “Publish” on my restaurant round-up post: http://www.susansolo.com/eating-and-drinking-our-way-around-isla-mujeres. I hope that helps, and have an amazing time! Susan - We pre-rented ours because we LOVE exploring on our own and would have been super disappointed if one was not available. There was still availability when we arrived, but that was in July. I would think mid-December is probably high season and maybe the availability could be lower. I would recommend making a reservation ahead of time if you can! Have an amazing trip!